My mom's Roasted Red Peppers are my secret addiction. I could eat them for each and every meal if I allowed myself to. I'm lucky to have such a great mom since she often shows up at my house with a container of the peppers just for me. (I guess my secret addiction isn't so secret.) Chris has also become a Roasted Red Pepper addict, so I've had to learn to share. 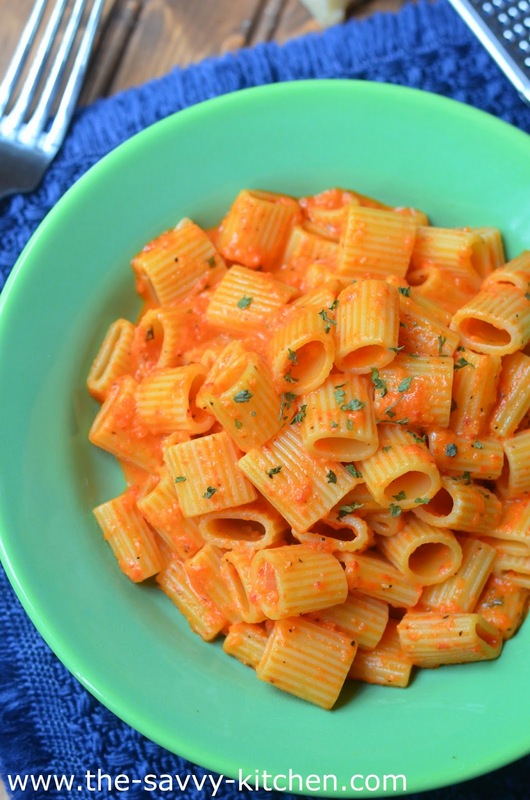 This pasta was right up our alley. 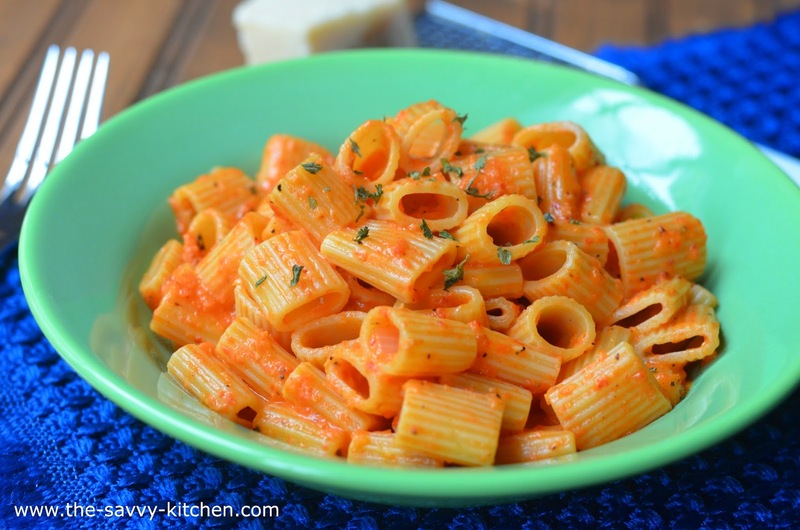 The roasted red peppers are pureed and turned into a creamy sauce for the pasta. I used jarred peppers since I didn't have any fresh ones on hand (we eat them too quickly), but either type would work. 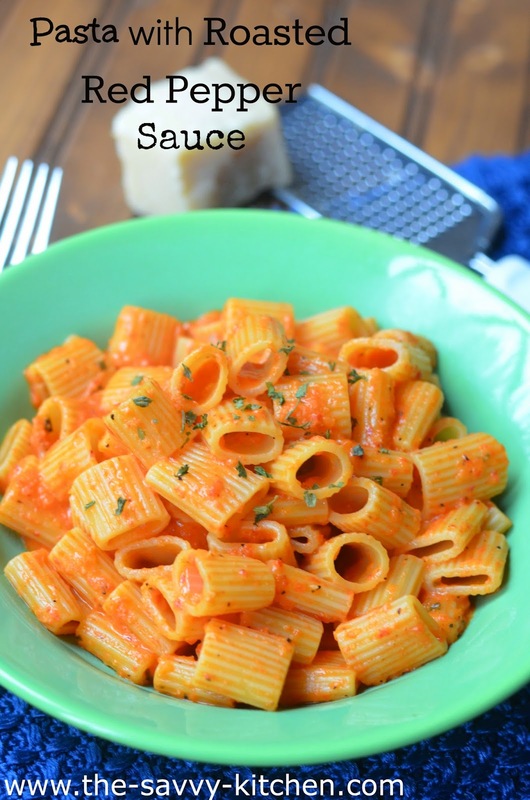 The sauce is creamy and a welcomed change to the typical tomato sauce we so frequently eat. This is definitely a recipe you need to try! Melt 1 tbsp. butter in a large skillet over medium-high heat. Add the onions and garlic and saute for 2 to 3 minutes or until starting to soften. Add the chopped red peppers and cook for 2 to 3 minutes, until hot. Add the remaining 1 tbsp. butter to the skillet over medium heat. Pour the pepper puree back into the skillet. Add the broth, salt, and pepper, and stir until heated. Splash in the cream and stir to combine. Add Parmesan cheese and stir. Taste and adjust seasonings if you need to. Drain the pasta and add it to the skillet. Add parsley, then stir it together to coat the pasta.